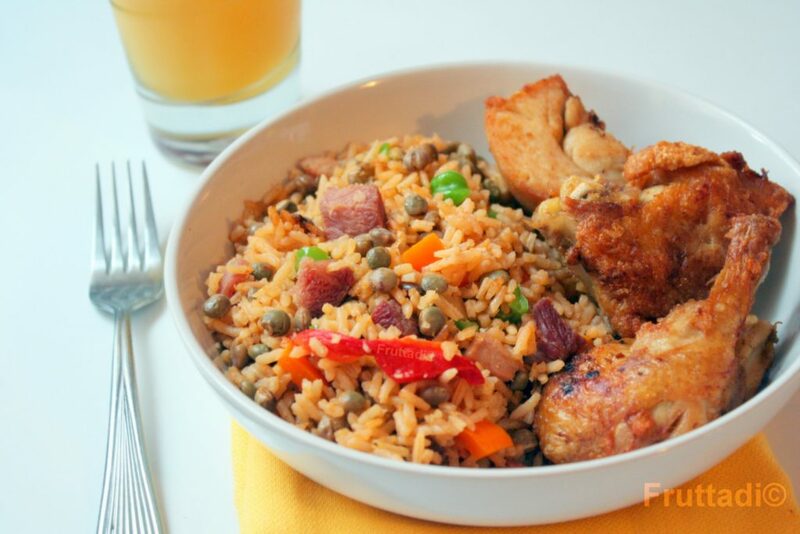 Arroz con gandules or pigeon peas rice is a staple in a Puerto Ricans diet. It’s considered a Christmas dish ,or important for any special ocassion, however; we make it all throughout the year. It is the star of our get- togethers usually accompanied by roasted pork, ‘pasteles’ or ‘guineitos in escabeche. Today, I’ll share my recipe with you, I hope you enjoy! Brown the peices of pork meat for about 7 minutes, then add pieces of ham. Incorporate all the ingredients including the liquid and cook for a few minutes. Add the rice and season to desired taste, and stir. When the water begins to evaporate, mix well. Finally, at the red pepper cut into strips over the rice. Cover the rice and reduce to medium low heat. Note: If you want to add a little more flavor to your arroz con gandules you can grate half a plantain to the mixture at the beginning of the procedure. You can also add a plantain leaf. You first have to wash it really well, and place over a hot surface, or stove burners to intensify and seal in the flavor. I made this recipe but for 40 people I’m not the best cook so I had to make quite a few calderos because I was afraid of messing up the recipe. I got so many compliments that even my mother was so proud of my arroz con gandules. I have to believe one of the most important ingredient is to make fresh sofrito it makes the rice so flavorful. Thanks for the recipe I will use this recipe over and over!